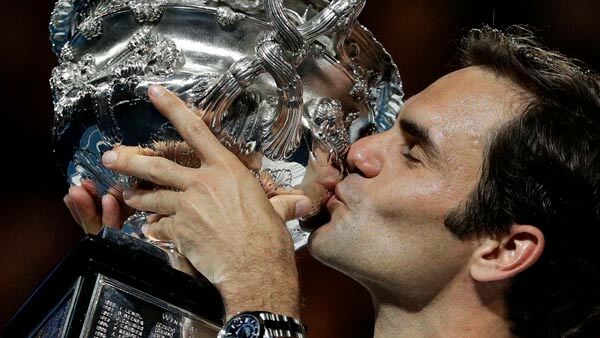 MELBOURNE, Australia -- Back where his career resurgence began with a drought-breaking triumph last year, Roger Federer cried as he lifted and kissed the Australian Open trophy for a sixth time and celebrated his 20th Grand Slam title. "I'm so happy. It's unbelievable," Federer said, taking deep breaths and choking back tears. "Of course, winning is an absolute dream come true - the fairytale continues for us, for me, after the great year I had last year, its' incredible." "Big congratulations to Roger and his team - it's amazing what you guys do," Cilic said. "It was an amazing journey for me to come here to the final. I had a slight chance at the beginning of the fifth, but Roger played a great fifth set." The Swiss great wasn't about to lose this one. Federer increased his level again, breaking Cilic again in the sixth game and then closing out at love - his celebrations delayed slightly by an unsuccessful challenge from Cilic on match point. It was a similar end to his five-set win over Rafael Nadal here last year and, just like 12 months ago, the tears flowed. Tournament referee Wayne McEwen can introduce the policy when the temperature reaches 40 degrees Celsius (104 Fahrenheit) and a measure called the wet-bulb globe temperature - which combines factors such as heat, humidity and breeze - reaches 32.5C (90.5F).